Carrots are delicious and nutritious root vegetables. Their many great health benefits include helping with weight loss, lowering cholesterol, and improving vision, since they are packed with Vitamin A. 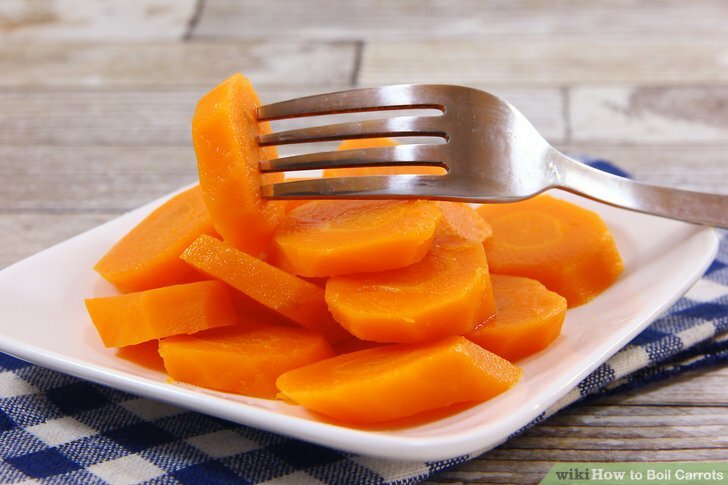 You can eat carrots raw, but they are also extremely easy to cook. Boiling carrots is a quick and simple way to bring out new textures and flavors in them. Choose your carrots. Stores usually sell carrots either in bunches with their green tops still on, loose with no greens, or in bags with no greens. Carrots with greens intact tend to be more expensive than carrots without their tops. Try to choose the freshest vegetables that you can. Look for carrots that have a deep orange color. Carrot pigment fades with time, so paler vegetables tend to be older. Avoid carrots with withered green tops, since they are no longer fresh. Carrots with lots of cracks and little hairy rootlets growing out of them are old. Wash your carrots. Scrub them with a vegetable brush under running water. Make sure you remove all the dirt. Cut the carrots. If your carrots still have their green tops, chop them off.You can then either boil the carrots whole, or cut them into pieces of any size. Carrots cut into smaller pieces will cook faster. 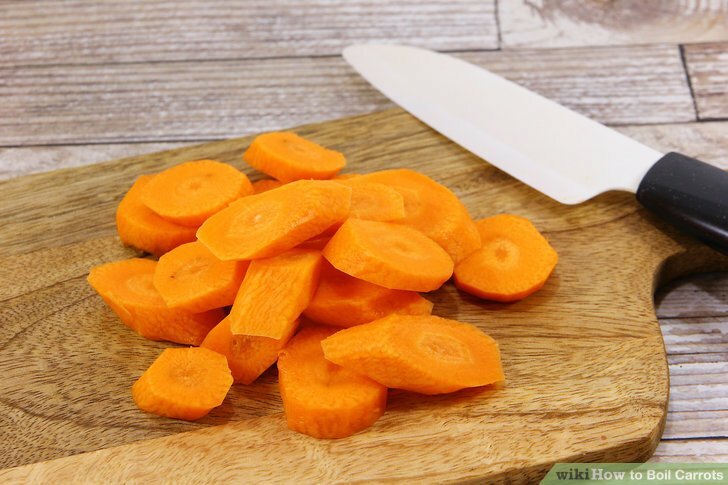 If you are pressed for time, cut your carrots into very small, evenly-sized pieces so that they all boil at the same rate. On the other hand, the boiling process leeches some of the nutrients and flavor out of the carrots through their exposed surface area. Chopped up carrots have a larger exposed surface area, and lose more flavor and nutrients in the boiling process than uncut carrots. Cooking carrots whole helps to retain both the taste and the nutrient levels. Bring water to boil. 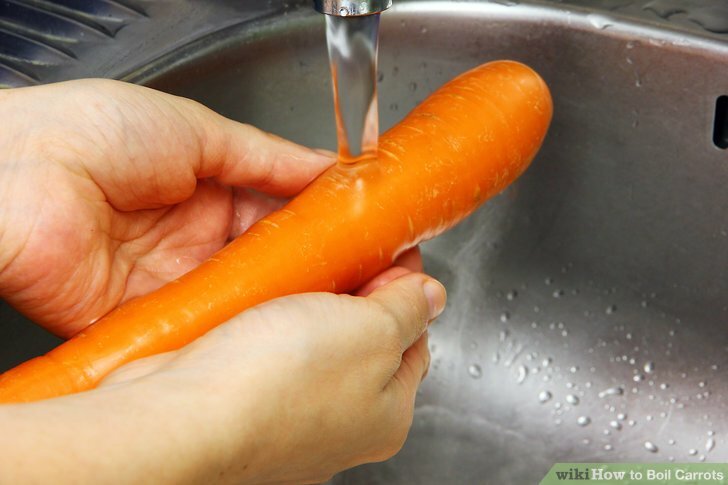 Fill a pot with just enough water to cover the carrots. Avoid using too much water in order to minimize nutrient loss. You can put some salt in the water if you want, which raises the water's boiling point and helps the carrots to cook faster while also adding more flavor. Put the carrots in the water. 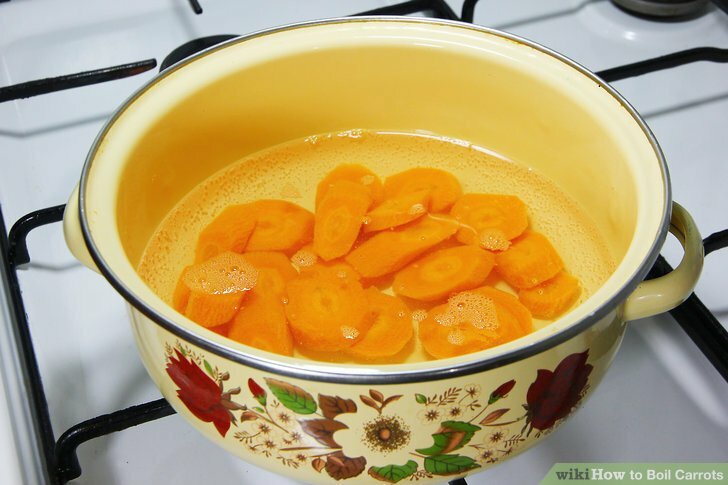 Once your water has begun boiling, add the carrots and cover them with the pot lid. Cook the carrots until they are done to your satisfaction. The cooking time depends on how big the pieces of carrot are, and how soft you want them to be. Check after five to ten minutes and continue boiling for longer, even up to half an hour, if the carrots are still too firm for your liking. 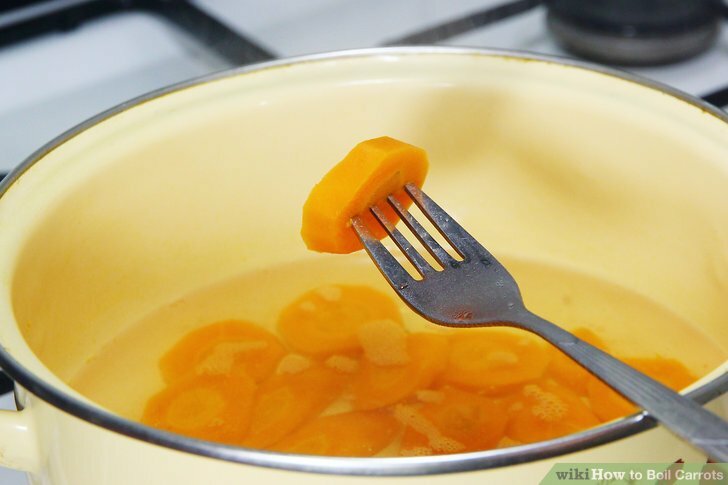 You can test doneness by spearing a piece of carrot with a fork. 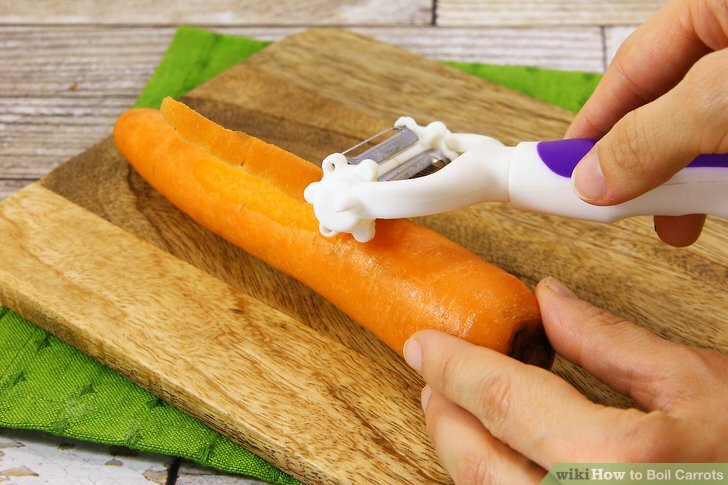 The tines should slide easily into the carrot. Drain the carrots. 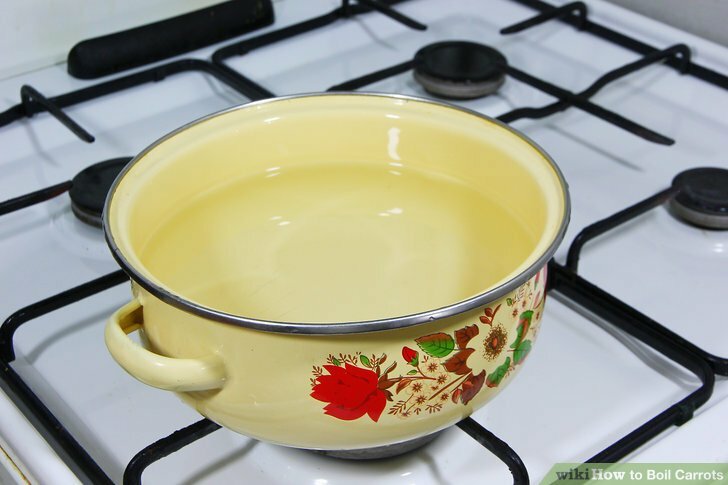 You can either pour the carrots out of the pot into a colander, or hold the lid firmly over the pot, leaving just a small crack at the edge, and drain the water out into the sink while keeping the carrots inside. You might want to wear oven mitts to protect your hands from the hot steam. Serve them hot. 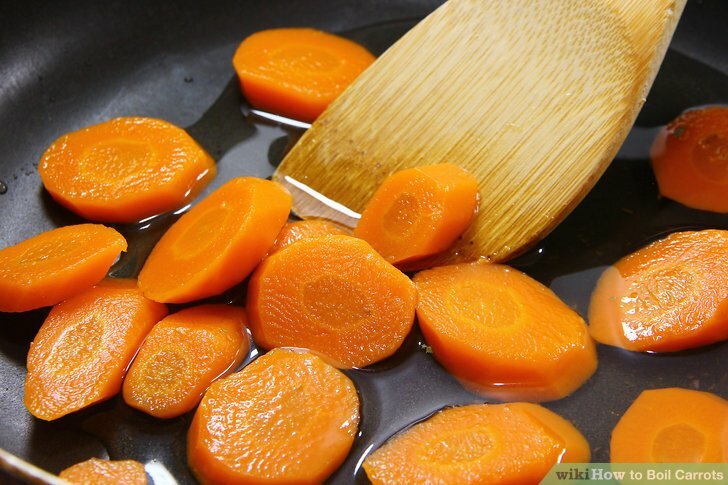 Your carrots will taste better if you eat them as soon as they are done cooking. If you are not planning on eating your carrots immediately, try blanching them - just boiling them quickly for two to three minutes - and then quickly cooling them in ice. After you dry them off, you can store them in the freezer in freezer bags. This quick boiling will improve the texture when you thaw them. 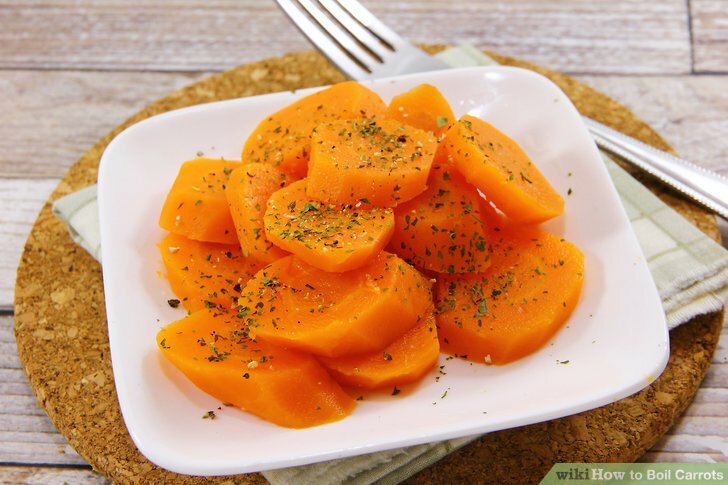 Cut the carrots into smaller pieces. 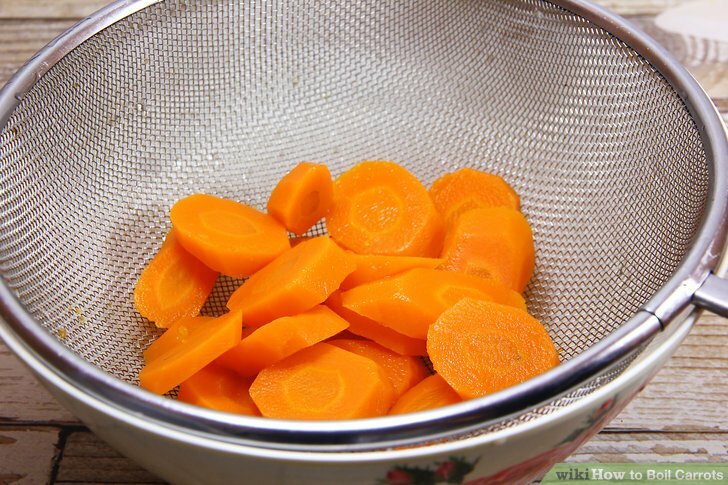 If you have boiled your carrots whole or in large chunks, you might want to chop them, dice them, or julienne them for serving. You can cut your carrots baton-style into sticks of any length you want. Dice your carrots by cutting your batons into small cubes. Make sure all the pieces are equal sizes. To do a julienne cut, take a whole carrot and cut a thin slice off one side to make a flat surface. This will keep the carrot steady. Put the carrot flat-side down and then cut it length-wise into very thin slices, no more than 1/8th of an inch thick. Pile all of your slices on top of each other and slice through them again to create thin pieces roughly the size of matchsticks. Season your carrots with herbs or spices. These add extra flavor to your dish. Salt, pepper, and garlic are all reliable seasonings for carrots and good standby options. Thyme and parsley both pair very well with carrots. Seasoning options are almost endless. Experiment with different flavors, such as tarragon. 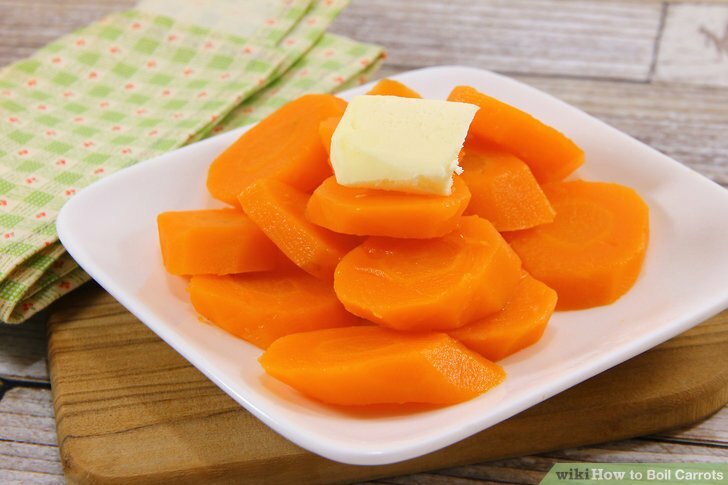 Flavor your carrots with some liquid fats or acids. This gives them another pop of flavor and prevents them from getting too dry. Drizzle the carrots with extra virgin olive oil or melt ****er on them after they are cooked. Try drizzling your carrots with a bit of balsamic vinegar. The tartness of the vinegar brings out the sweetness of the carrots. For a simple glaze, melt ****er in a sauce pan and stir in sugar and a pinch of salt until they have dissolved. Put the cooked carrots into the mixture and cook them in it for about five minutes until they are covered in the glaze. Experiment with different ingredients in your glaze. Try replacing sugar with maple syrup, for instance. Add some herbs, ginger, or citrus zest to give the glaze an extra pop of flavor. Store your carrots until you are ready to cook them. 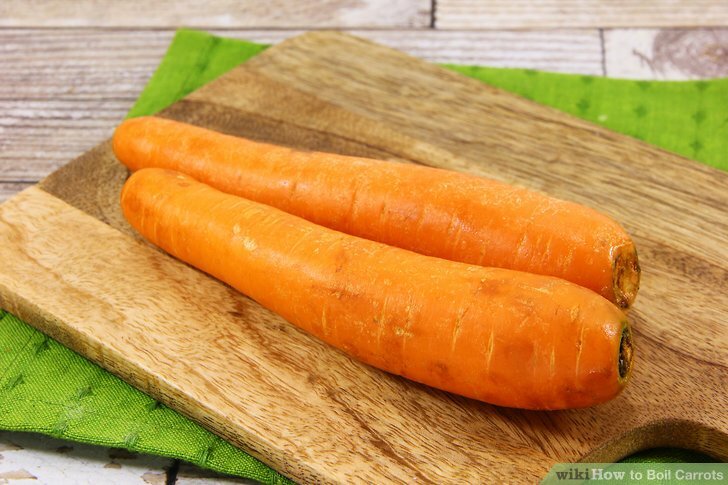 If you buy your carrots but don't want to boil them right away, put them in a plastic bag in the refrigerator, since they lose their crisp texture and sweet taste at room temperature. Cut the green tops off your carrots when you store them, because the greens draw moisture out of the root and spoil the texture. 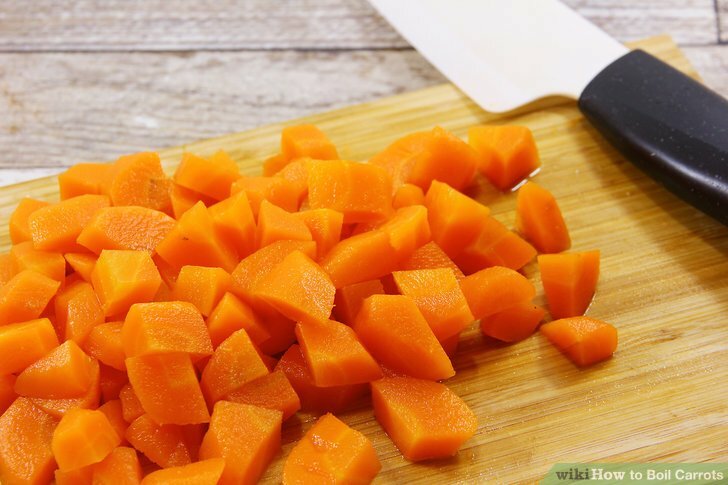 Make sure that the carrots are very soft and cut into very small pieces if you are preparing them for an infant or toddler. Harder carrots and bigger chunks are difficult for small children to chew and present a choking hazard. Pieces should be no bigger than 1/2 an inch in any direction. If you have any doubts, cut them even smaller.